Lance Orozco picked up the 2017 National Society of Professional Journalists Sigma Delta Chi Award for Best Radio Feature Reporting among small-market stations at the National Press Club in Washington, D.C.
(WASHINGTON, D.C. – June 13, 2018) KCLU Radio News Director Lance Orozco received his fourth national award for excellence in journalism on Friday. 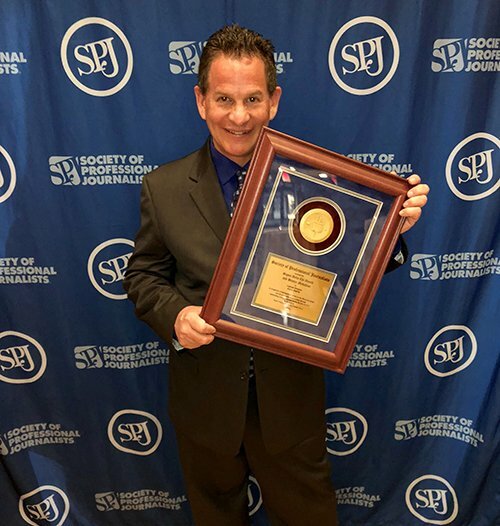 Orozco picked up the 2017 National Society of Professional Journalists (SPJ) Sigma Delta Chi Award for Best Radio Feature Reporting among small-market stations at the National Press Club in Washington, D.C., for his story on the only dog trained to track down a specific species of ant in the wild. In May, Orozco received three awards from the Associated Press for radio news coverage in the Western United States. He was honored in the public service category for his Thomas Fire coverage, for his feature on Ventura County’s history with the Dallas Cowboys and for his use of sound in a story on Ventura County Fair food. In April, Orozco picked up two 2018 Regional Edward R. Murrow awards among small-market stations for his Thomas Fire coverage and a look at the opioid crisis through the eyes of a mother who lost her son to it, and reporter Debra Greene received one for her feature on preschoolers’ hands-on science experience. The national award honored Orozco for his story on Tobias, a former shelter dog sniffing his way through Santa Cruz Island looking for Argentine ants to make sure the invasive pests had been eradicated. Orozco’s story, which aired in August, featured comments from the yellow lab’s handler and an ecologist as well as the sounds of Tobias panting, yelping and walking through brush. Judges chose a total of about 80 winners in various categories from more than 1,300 submissions from radio and television stations, newspapers, online news outlets and magazines. To listen to Orozco’s story on the ant dog, go to http://kclu.org/post/one-kind-ant-dog-searches-invasive-ants-channel-islands#stream/0. This is Orozco’s fourth national journalism award. The National SPJ honored him for the first time in 2013 with the Best Feature Reporting award for his story chronicling his battle with kidney cancer and again in 2017 for his coverage of the Sherpa Fire. In 2010, he received a National Edward R. Murrow Award for Best Audio Sports Reporting from the Radio Television Digital News Association for his profile of the oldest living team member of the Dodgers. Orozco has won more than 200 regional journalism awards for KCLU and has been named the Associated Press Small-Market Reporter of the Year in the western United States 10 times. KCLU, a community service of California Lutheran University in Thousand Oaks, provides National Public Radio and local news programming to more than 100,000 weekly listeners in Ventura County at 88.3 FM, southern Santa Barbara County at 1340 AM and 102.3 FM, Santa Maria at 89.7 FM, San Luis Obispo at 92.1 and online at KCLU.org.